Slough Borough Council, supported Arts Council England, would like you to tell us how we can work together to support all Slough residents and visitors to enjoy exciting arts and cultural opportunities for everyone in Slough. Please open the link https://www.surveymonkey.co.uk/r/VWVGXFKand complete the online survey, it should take less than 10 minutes. If you have any trouble with the link or would like the survey in a different language, please email thecurve@slough.gov.uk, as everyone’s ideas are important to us. Please share this link with your friends and family too - we want to ensure we represent as many people living, working and visiting Slough as possible to help us create the best arts available over the next 5 to 10 years and your opinions will help us with this. The survey will close on 18 March 2019. Thank you for your time. ​An award from the Mayor! 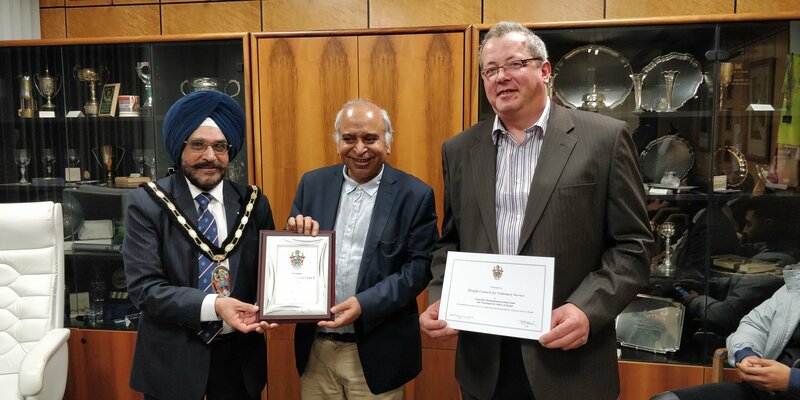 Slough CVS is delighted to have received an award from the Mayor of Slough, Cllr Paul Sohal, in recognition of its service to supporting and developing the voluntary sector in Slough. Ramesh Kukar, CEO and Jamie Green, Chairman of Slough CVS (pictured above) were presented with the award this week. 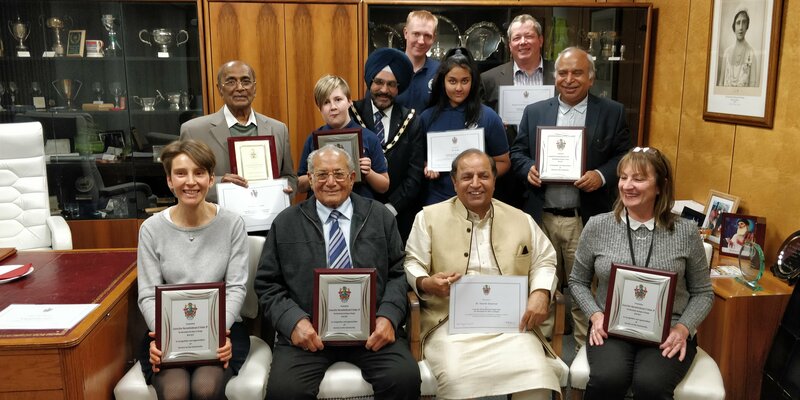 Slough CVS were one of a number of organisations receiving the award, including Aik Saath and Slough Foodbank. The council want to make sure private rented properties offer residents a choice of safe, quality and well managed accommodation. They know most landlords operate professionally and the private rented sector provides housing options for local people. Sadly, we still have concerns about levels of anti-social behaviour, overcrowding and some properties that fail to meet satisfactory levels of tenancy and property management. They’re now proposing two new licensing schemes to tackle these issues. These proposals would allow the council to focus action against landlords who ignore their responsibilities while providing light touch regulation for landlords who are compliant. This scheme would cover ALL small houses in multiple occupation (HMOs) not covered by mandatory licensing. This scheme would require the majority of properties rented to single households or two unrelated people in the Central and Chalvey wards to be licensed. The consultation will close on Thursday 31 January 2019. The #ReachOut campaign to tackle loneliness and social isolation, launched on 1st August at the Playday event. The aim of the campaign is to improve the health and wellbeing of Slough residents by encouraging people to ‘reach out’ and seek help and support if they are feeling lonely or socially isolated; as well as offer advice to people wanting to help those who are lonely or isolated. On the day, cabinet member for health and social care, councillor Natasa Pantelic spoke about the campaign and how we can address the issue in Slough. She was joined by organisations and voluntary groups from across the borough supporting the initiative and offering advice and information for those suffering from loneliness or isolation, or for those who think they may know someone who is. The groups also highlighted the many events and volunteering opportunities residents can be involved in as part of #ReachOut, such as the Slough Befriending Service, which offers support face-to-face or by phone to anyone living in Slough, and Good Gym, the new running initiative where you can get fit, make friends and volunteer all at the same time. Councillor Pantelic said: “We are launching Reach Out because we want to reduce the likelihood of someone becoming lonely or isolated in our town and ensure they are able to access support when they need it. “We are encouraging residents to be alert to this possibility and provide help and support to neighbours, friends and families at the right time. Whether you’re feeling lonely yourself or you know someone who might be, visit the official page for tips and advice on how to ‘reach out’, as well as links to local organisations and charities who can provide help and support. There are also details on spotting the signs of loneliness and social isolation, from a change in a person’s situation to illness and more. This information should hopefully help people to spot signs in themselves or others around them. Council staff as well as members of the Slough Wellbeing Board will also be making pledges to help tackle this issue, including checking in on a neighbour each week, getting involved with volunteering and outreach and more. To find out more about the campaign, visit www.slough.gov.uk/reachout and follow @SloughCouncil on Twitter. How many letters in the word BLUE?